The analyzer provides an opportunity to examine correlation in history, for example, for the previous month excluding the current one, thus allowing you to evaluate symbol movement in history. It can be conveniently used in conjunction with LineSyncMirrorChart analyzer. 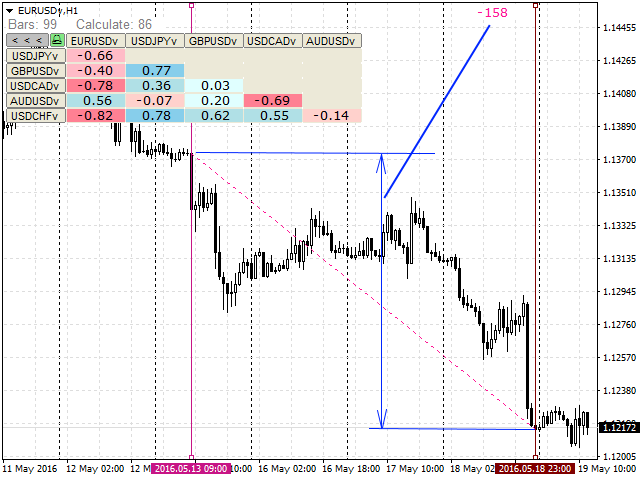 Charts are synchronized by a market type: Forex, CFD, Futures, and Indices. The analyzer calculates the distance covered by the price on a specified period in points. The tool fits pairs and portfolio traders. Does not work in the tester. The indicator calculates the correlation using the Pearson equation. The correlation is calculated considering a timeframe. The indicator features the ability to activate an audio signal when a selected level is reached (by default, from 0.98 to 0.99). Set the finish line on the current bar and disable highlighting. 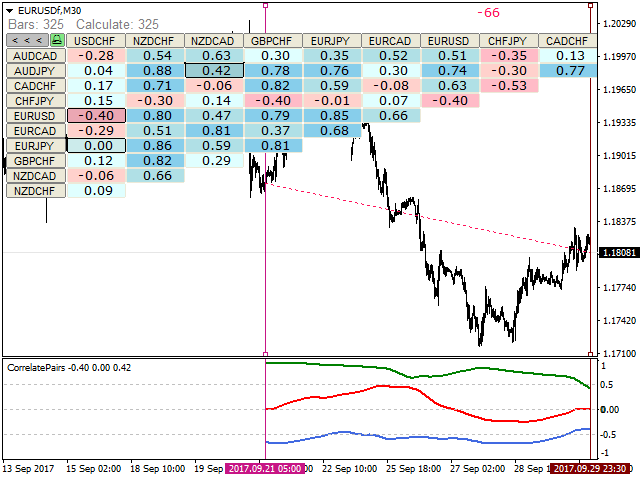 The analyzer allows examining correlation on history on any timeframe for better assessment of the market situation. 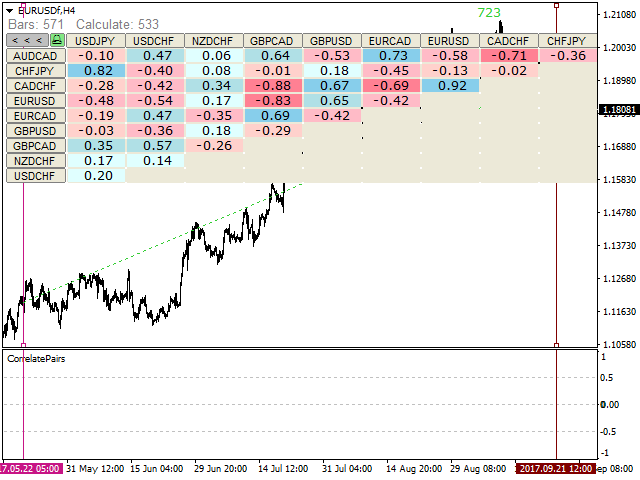 Full synchronization of all open charts: scrolling, timeframe, as well as display of style and candle/bar size. 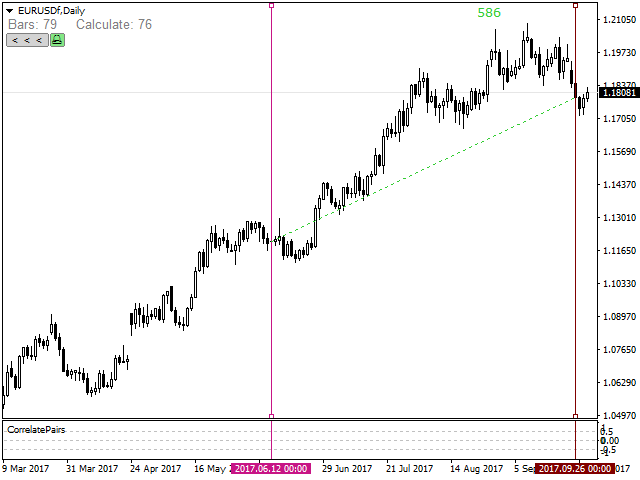 Calculation period is selected by setting vertical lines. The lines are synchronized by time on all charts. Attach to a single chart only. Show Instrument - select the market type. Sort Symbol Name - sort the symbols alphabetically. Count letters NameSymbol - the number of displayed symbols on the buttons. 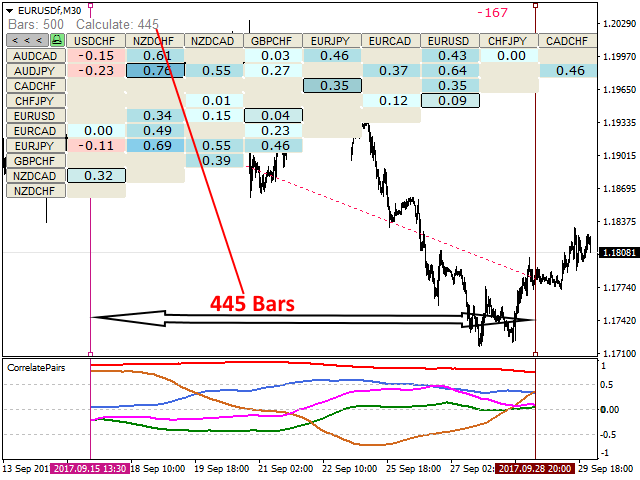 Synchronize All Charts - synchronize all open charts. Line back in history - the number of look back bars during the first installation and timeframe switching. Show identical characters - show buttons with the same component symbols. Show Canvas - show the background for the entire width and length. Color Line Start - reference-starting point line color. Color Line Finish - reference-ending point line color. Style Line - line style. Width Line - line thickness. Selected Line - select lines for dragging. Color Plus - positive value color. Color Minus - negative value color. Color Null - zero value color. Value Min - minimum value. From 0 to 0.99 with a step of 1 (0-0.1 / 0.98-0.99 / 0.49-0.51, etc.). Value Max - maximum value. From 0 to 0.99 with a step of 1 (0-0.1 / 0.98-0.99 / 0.49-0.51, etc. ).